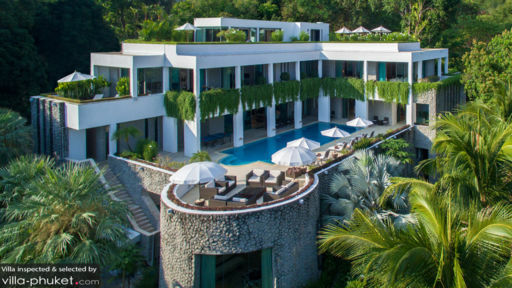 With its hanging gardens, prime hillside location and ocean views, Waterfall Bay is a vacation rental that stands out from the rest. It’s located just minutes away from Kamala Beach, placing guests within proximity to an array of dining and lifestyle establishments. 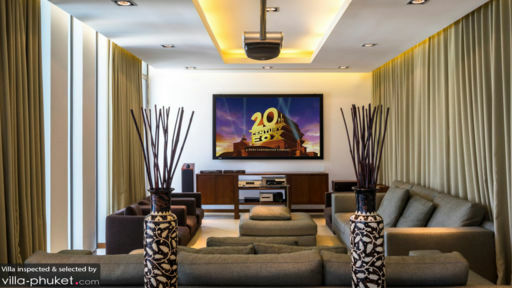 You’ll enjoy impeccable service from an on-site team, as well as a wide-ranging variety of amenities, including a beautiful pool deck, spa facilities and cinema room. Waterfall Bay accommodates a total of 12 guests in six bedrooms. Two of the rooms are generously proportioned master suites, both of which include en suite bathrooms with bathtubs or jacuzzis. Of the remaining bedrooms, three feature king beds, while the fourth is outfitted with twin singles. A spacious, sparkling pool takes centerstage outdoors at Waterfall Bay. Dry off from a swim upon one of the sun loungers, or sit back and relax with a cocktail at the poolside lounge. The capacious outdoor space also contains a ping pong table and alfresco dining area. A breezy rooftop terrace offers a more private ambience to unwind and take in the lush, scenic surroundings. Contemporary and ornate, the living spaces at Waterfall Bay feature decorative hanging lamps, elegant furnishings and Asian accents. The interiors feel bright and airy, thanks to the lofty ceilings and floor-to-ceiling windows. The main living area is outfitted with plush sofas, a flat screen TV and expansive windows that draw the eyes out towards the picturesque hillside landscape. The dining area, featuring a billiard table and two dining sets is decked out in a sleek, monochromatic colour scheme. Stainless steel fixtures are dominant in the fully equipped kitchen, which comes complete with a breakfast bar and island counter. Chill out in the cinema room, work on personal projects in the study or unwind with a massage in the beautifully appointed spa room. Enjoy top-notch hospitality from an on-site team that includes a villa manager, Thai chef and personal driver with a nine-passenger vehicle. Villa pre-stocking, personal chef service, daily breakfast service, in-villa spa services, driving service, airport transfers, laundry service, child minding services and travel activities are available at additional cost. 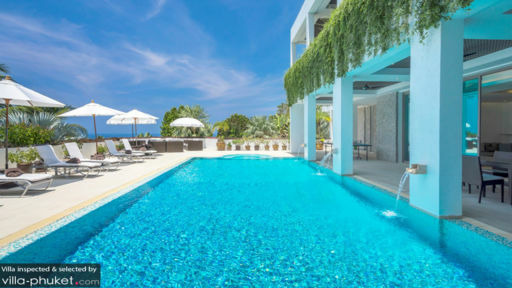 Waterfall Bay Villa is located in Kamala, West Phuket. Located just north of Patong, Kamala is far quieter in comparison, and draws in a family-friendly crowd with its relaxed vibes and wide-ranging variety of beach dining and shopping options. Kamala Beach boasts a white sand beach, clear waters and a good selection of seafront venues. The waters are good for swimming and surfing; gentle swells at the southern end are great for beginners, while the central region attracts advanced surfers with waves of up to three metres. Just 10 minutes’ walk from the beach is Kamala Night Market. Held every Friday evening, the bustling outdoor event offers a family experience, and is a great way for vacationers to discover the local street food and shopping scene. Spa treatments, massages, yoga and meditation are available at the nearby Paresa Resort. Try your hand at cooking easy-to-learn Thai recipes at BrassWok Thai Cooking Studio. The classes are comprehensive and informative, and includes a visit to the local market for ingredient shopping. The highlights of the island include the Big Buddha, a hilltop temple compound with a 45-metre Buddha statue crafted out of white marble, as well as Wat Chalong, where a bone splinter of the Buddha is enshrined in a chedi. Make a stop by at Khao Rang Viewpoint (also known as Rang Hill) to take in uninterrupted vistas over the south of the island, and out to the neighbouring islands and Big Buddha. Combine this with a visit to Old Phuket Town, located just 11 minutes’ drive from the viewpoint. Here, you’ll wander through quaint, atmospheric streets lined with Sino-Portuguese buildings, and get to explore museums, temples and cafes. From French bakeries to steakhouses, Kamala offers numerous options for dining out. Places we’d recommend include Lafayette French Bakery, HQ Beach Lounge, Vanilla Sky Bar & Gastro Pub, Silk Restaurant and Bar, Plum Prime Steakhouse and Ambassador Bistro.